The Way of the Metagamer - Wait, Why Did That Guy Just Heal Our Party? 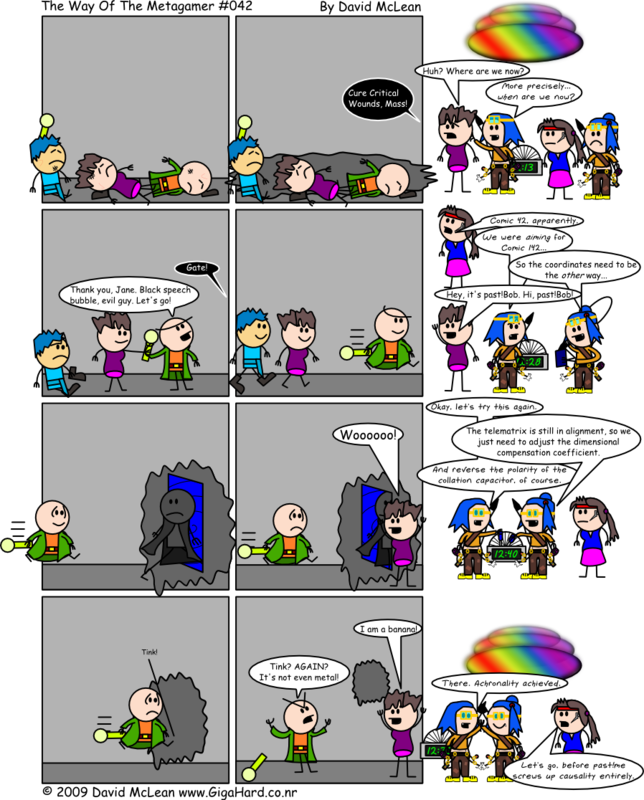 Comic 42 - Wait, Why Did That Guy Just Heal Our Party? Seriously, what's up with that? Wasn't that guy, like, the ultimate evil or something? Woah! Time travellers? Drastically better art? Fonts that aren't trite and overused? What's going on? This, and the next few pages, have been altered by the effects of wikihistory time travel. If you're a new reader, or you'd just like to see the pages before the change, you may read through them on the wiki. Hmm, I think I'll stick with these pages, even though I'm a new reader. Time travel which appears before the reason behind it is implemented, like in Harry Potter 3, is my favourite kind. Trope-Tan!!!! Always nice to see another Troper out there, reminding me that, although my life has long since been Ruined, I Am Not Alone.